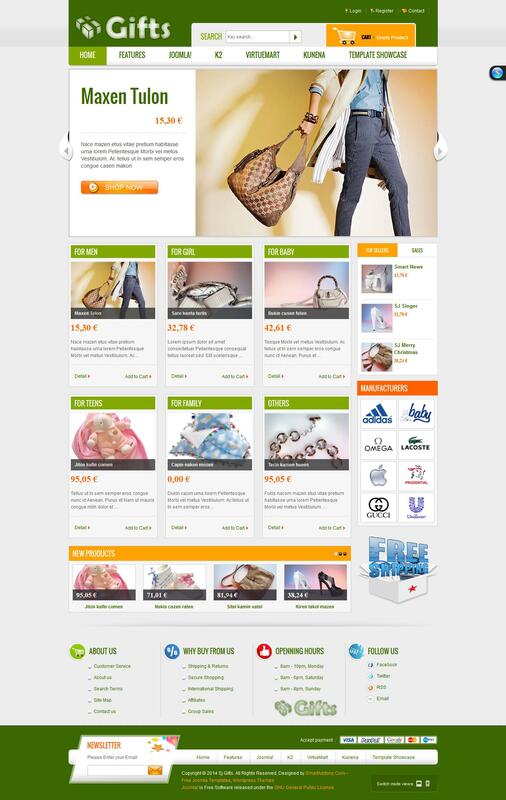 SJ Gifts - another stylish template internet - shop from developers SmartAddons. This template supports online commerce component VirtueMart, flexible content management manager K2 and a popular forum on the basis of Kunena. Among the main advantages worth mentioning: fast loading pages, progressive downloading images as you scroll the site, Google fonts support, compatibility with mobile devices and more. Cpanel provides a convenient quick change template style, font size, width, layout and module positions. The package includes the best clubs expansion studio: SJ Basic News, SJ Login, SJ Minicart Pro, SJ Moduletabs, SJ Virtuemart, SJ VM Extra Slider, SJ Mega Products and SJ VM Slick Slider, which are qualitatively improves the functionality of the template.